"The Day Garth Canning Saved Phil Topar!" 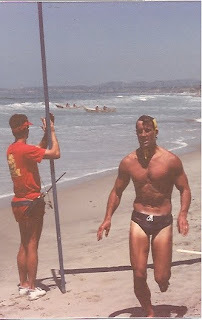 Once upon a time, on a bright and sunny summer day in Huntington Beach, Calif at Bolsa Chica during the Bud Light Lifeguard Competition Series produced by Scott Hubbell..... LACo posted a team of competitors as talented and deep as at any other time. Think: Mitch Kahn, Phil Topar, Mel Solberg, National Rowing Champ Duo, Jake and Dale, yada yada yada..... The undersigned was in attendance with his then Pentax camera with telephoto lens (with film), in the days well in advance of digital technology. It was during the last lap of the Bud Light Dory race that afternoon that a near tragedy occurred. The historical significance of this incident takes on special importance today because of the recent accident and tragedy down under during the 2010 Australian National Lifesaving Championships when a young Aussie lifeguard was killed while negotiating 10 foot face plus surf during the surfski competition. In spite of the immediate rescue and recovery efforts undertaken to locate young Simon Bird, alas it was too late and he was gone. This event down under underscores the danger inherent in lifeguard competitions and the importance of fellow competitors and on duty lifesaving staff "Staying Vigilant" and every effort being taken to prevent injury to competitors. Mother Nature holds the wild card, however, and it is this awareness of this wild card that we take this opportunity to tell for the first time what happened that day back in the late 80's in Bolsa Chica. In an effort to cover this incident as comprehensively as possible, "County Recurrent" once again adopts the Rashomon perspective, e.g., from several different points of view. In this regard, we are fortunate to have the contributions of Phil Topar, Garth Canning, Tom Katsouleas, Mel Solberg, Scott Hubbell and the undersigned. So please sit back and read each of these terrific recollections and remember the moral of the story here is to "Remain Vigilant" at all times and to watch the water and the competitors. I am hoping to write and publish on the "County Recurrent" blog a multi person p.o.v. story on the day "back in the day" when a wave caused the Topar-Katsouleas dory to breach and flip in the surf. I thought it was at Bolsa Chica, but it may have been in San Clemente just north of the pier. Not sure. I took several photos that day of that event/incident. I am enclosing a pdf of 2 of these photos... I am hoping that each of you will remember something about this day so that a story can be developed that will be entertaining to our readership and colleagues and at the same time remind them of the risks, rewards and the importance of being vigilant, as was Garth that day when he yelled out that Phil had not come up, which instigated an immediate rush to the dory to find him! Scary, exciting, and thankfully a happy ending. I will publish the story with better versions of these photos and others. I look forward to your contributions. I really would prefer not to publish this story just from my own perspective. Your assistance will be greatly appreciated. If you have any questions, please advise. I think it was the San Clemente Ocean festival. As Phil and Katso were coming in on the last lap, their boat turned slightly and as Phil jumped out, a wave hit the boat, the boat flipped and the far rail of the dory came across and hit Phil square in the back of his helmet. I dolphined out to find Katso next to the flipped dory and NO PHIL. I lifted the upside down dory by the rail and Phil slowly came up, I yelled are you OK and he said rather quietly "no". We got Phil to the beach, I think he was checked out by Paramedics, was cleared, and then went back to competing. 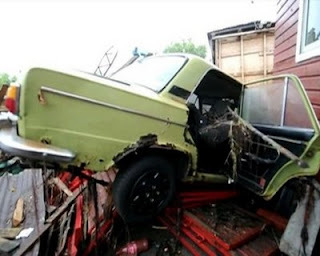 Before and after the crash are lost in time, but the crash and what happened in the water are burned in to my memory. About 5 years later, at a dinner at Mike Newman's house, Mike played a video of the entire race and crash. Southern Section, Lifeguard Division, LA County Fire Dept. (Photo shows Mel Solberg checking Phil Topar's level of consciousness and vitals shortly after being returned to the beach. Mel knew something wasn't right when he asked Phil what his name was and he said, "Greg Bonann". 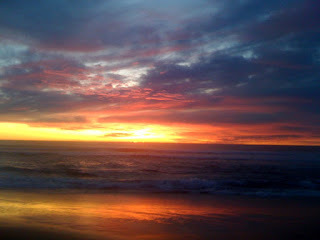 It was at Bolsa Chica during a Bud Light series. The surf was not big (2-3 feet) with a long shallow shelf. Katso and I were finishing up our last lap and riding a wave into shore. The boat breached and we started to lose the wave, so I jumped out of the boat to try to body surf the wave into shore. As you know the last lap is exhausting, so I ran out of air pretty quick with my head down trying to stay in the wave….. I picked up my head for a breath and my helmet hit “something” – It only took a few seconds to realize someone’s boat was upside down, and I was underneath it. I remember trying to remain calm but air was an immediate priority. As I searched for air, I noticed that I was in shallow water (3-4 feet), was probably in the bow of the boat between the seat and foot straps, so I tried to reach underneath the gunnels to try and tip it up so I could escape – it did not work as the natural “suction” of the dory was holding it in place upside down. 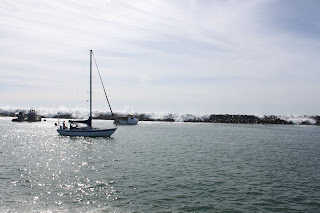 My only choice was to look for an air pocket on the upside down deck – I remember pressing my mouth against the deck and taking a breath of the ocean. I know I passed out due to a lack of air, and I do not think it was much after that (probably 5-10 seconds max – a pure guess) Garth had me under my arms. I remember taking a huge gasp of air as I was being pulled from underneath the boat, but I can tell you I had no idea where I was, who had me in their arms, or what had happened…..I am very thankful to Garth and Mitch Kahn who just “happened” to notice I was missing – they were “on duty” while racing. The PM’s did check me out for water in my lungs and I did race (poorly) the Ironman about an hour later. That’s about it, Phil. (The two photos above show the Paramedics, who arrived quickly, checking Phil's vitals, including blood pressure. Photo by Will Maguire. Used here with permission. What a memory you guys have sparked! So I guess I will weigh in what I experienced (mostly facing the other way). I do recall Phil diving out to bodysurf home. The boat kicked sideways and got very light and flipped on the next wave. I remember popping up and reacting automatically to a flipped dory (no comment about why I was so practiced at this please) -- getting on the surfward side of the boat, rotating it bow/stern perpendicular to the wave fronts and lifting... except this time the boat didn't roll over. Instead the far gunnel struck bottom. It was too shallow and the boat was sucking to the sand. 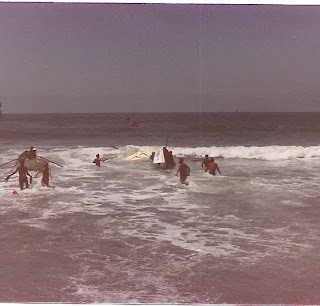 I remember waiting for the next swell after that to get some water under the boat to try again. By then help (I think Garth and Mel) was there and the boat went over and out staggered Phil much to my surprise. I remember his quiet "no" to the question "Are you all right?" That was chilling and did have a lasting impact on both of us. Fortunately, there are many more positive memories of rowing with Phil and many fellow dorymen and friends. Katso. I REMEMBER THAT THE GANG MOBILIZED VERY QUICKLY AND THERE WAS MORE THAN ENOUGH TO TAKE CARE OF THE TASK . PHIL HAS ALWAYS BEEN A FAVORITE OF THE CREW. IT WAS "ALL HANDS ON DECK" WITH A FERVOR! As Phil mentioned above, a little over an hour after this incident, he returned to compete in the Ironman, in a truly inspirational and studley exhibition of perseverance and overcoming adversity. Many Thanks to Garth, Mel, Phil, Tom, and Scott for contributing to this article. 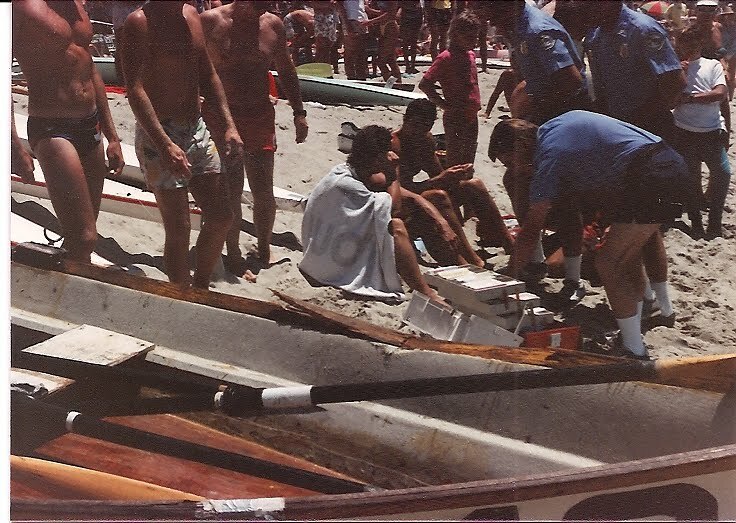 The team efforts of each of the competitors and especially the vigilence of Garth, Mitch, Mel and Katso, and the other bystanders and competitors who rushed to the submerged and overturned dory immediately after Garth's halycon call that I will never forget, "Phil has not come up!!!" 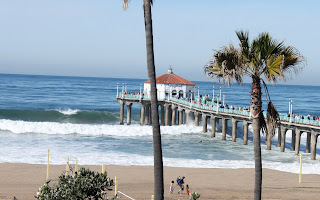 On Tuesday, March 16th at 45th St. in Manhattan Beach, a Helicopter pilot /slash/ Stand up paddle (SUP) board instructor was SUP surfing when he went for a rollercoster off of the oncoming white water wave. He caught an edge, wiped out and felt his calf muscle hit by his fin. The result was a fillet of calf muscle. Fin one, surfer 0. 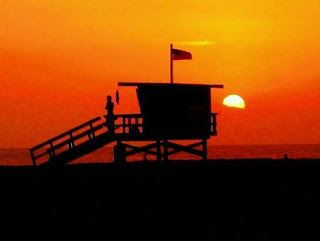 I was at the 42nd Street lifeguard tower while my permanent, Greg Edmonston, took Unit No. 163 to the scene. Greg handled the fillet of calf like a seasoned pro: checking vitals, dressing the wound, and transporting the victim, Wade, to the paramedics for another save. Wade showed up yesterday, to thank Greg , and pick up his board, but Greg wasn't here. Wade had 22 internal stitches, and 30 external stitches. Good job Greg. "Making play look like work. For this is a well skilled and learned art. To save people in any surf. Fun and exciting, still." Many Thanks to Kip for once again sharing with us another gem of a story of one of our colleagues doing what they are paid to do, saving lives and living large ! And Kudos to Greg Edmonston for his dedication to duty. "BIG DAYS Past", by Bruce Morgan, LACo O.L., Ret. We all have days we remember. April 13, 1980, I was at Tower #15 on Santa Monica North partnered with another recurrent, Greg Bonann, who later created and executed produced the BAYWATCH television series. Greg and I had just sat down to relax after many foot patrols when eight or more male beach patrons walked into the water with jeans on. This jean attire was a dead give away for drinking and other matters. Greg and I then briefly discussed the option of using the paddleboard or not with Greg communicating that with the beach crowd forming a thick wall of people, many rows deep, that the guard who commits to taking the board out on the sand has lost the big picture perspective. After considering this concern, I opted on the side of caution and I took our Tower #15 paddleboard out to advise all the clothed bathers to return to shore. As I was paddling out, Greg saw each man sinking fast and made a call for back up and then headed for the water himself with his rescue can. I reached the victims and using the paddleboard I threw two victims, both drunk and aspirating, over the Big CON laco paddleboard, which in those days had a very good buoyancy factor. The CON was full with at least five victims hanging with the CON acting as, in effect, a "rescue island", while Greg and the back up guard approached. I then proceeded to swim to the last fool who I found only by his air bubbles. But one more appeared... yet a ninth victim, crying in the arms of a good samaritan-patron in deep water. 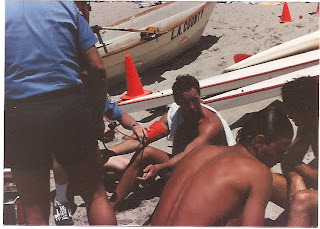 I gave this final and ninth victim my rescue can and just then Walley Reeves with Tom Pani gunned up the big engine of nearby Baywatch Santa Monica, which had been moored inside the north end of the adjacent Santa Monica Pier. Jimmy Makuta told me later by phone that I had prevented nine drownings. I also got a letter from the Captain, then called a Lieutenant, namely, Dan Culbert, asking me to work on schedule in his area, Santa Monica North. After this late hour rescue that demanded such a strong response from LACo's vast lifeguard resources, Lt. Culbert drove down in his beach unit and observing more drunk bathers entering the water in our area just after the nine-victim rescue, and without any ceremony, put out a public announcement over his truck's PA system, and said: "Folks, its seven o'clock, we just stopped nine drownings, so just give us a break and go home !" He then repeated this announcement and to my surprise people got up and left. Oh for the days when sensitivity and red tape were not issues. Santa Monica Tower #15 is still a place I visit in dreams. But because I anticipated the next ten minute event - I don't let Tower #15 visit me in nightmares. Many Thanks to Bruce for sharing this great rescue story which highlights the importance of paying attention to one's instincts, not to mention the vast lifesaving resources that our Department has to protect the public. For those readers who do not know Bruce, he was a LACo Recurrent for over 30 years and retired several years ago due to personal health issues. Otherwise, he would most certainly still be putting in more than his fair share of days at the beach. 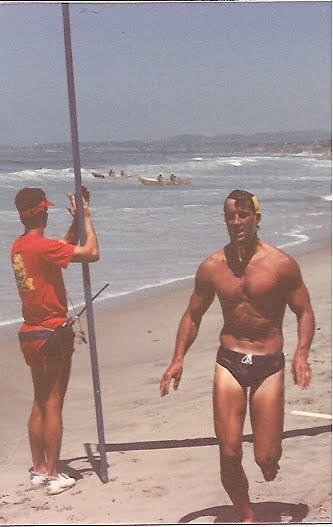 Always a beach lifeguard first, Bruce put in over 10,000 days at the beach. In tribute to his years of service, Bruce was awarded the "Bronze Savage" by LACOLA in Sept. 2008 at the Annual Meeting that fall in Venice, Calif. on the boardwalk. First Place, aka, "The Gold Squeegee" for the Best Blog Post is a TIE ! That's right, folks ! It was a back and forth tug of war but in the end it was both Bill Powers and Cal Porter in a dead heat and so we must split the squeegee, as it were. Congratulations to both Bill and Cal ! Bill has been retired for six or seven years or so and lives year round in Mammoth Lakes, Calif. where he has had a home for many years. Most people know Bill as a former Zuma S.O.L/OLS and Call Car Dude. According to Jimmy Doman, Powers was also the Recreational Director at Zuma during his years there. When permanent personnel would be assigned to Zuma they would be told to check in first at Headquarters regarding their assignment and then to speak to Powers who would discuss with them the recreational choices and opportunities available while off duty, both on and off the beach. Cal, of course, was the winner of the Inaugural Gold Squeegee Award this past year and his repeat performance this year is now the stuff of legends. But Heck!... there is no surprise there! After all, Cal Porter's stories rock! Rumor has it that Buddy Bohn and Gary Crum are still busy trying to work out the gps coordinates for the location of where Cal found all those lobsters "back in the day". II. The Silver Squeegee, for the runner up blog post of the year. Congratulations, Mike ! Please keep contributing to our blog. In the PHOTO Category, the Winner of This Year's BLUE SQUEEGEE is none other than Kevin Curtis for his Classic Sunset/Tower Photo, below. Congratulations, Kevin ! Keep shootin'. 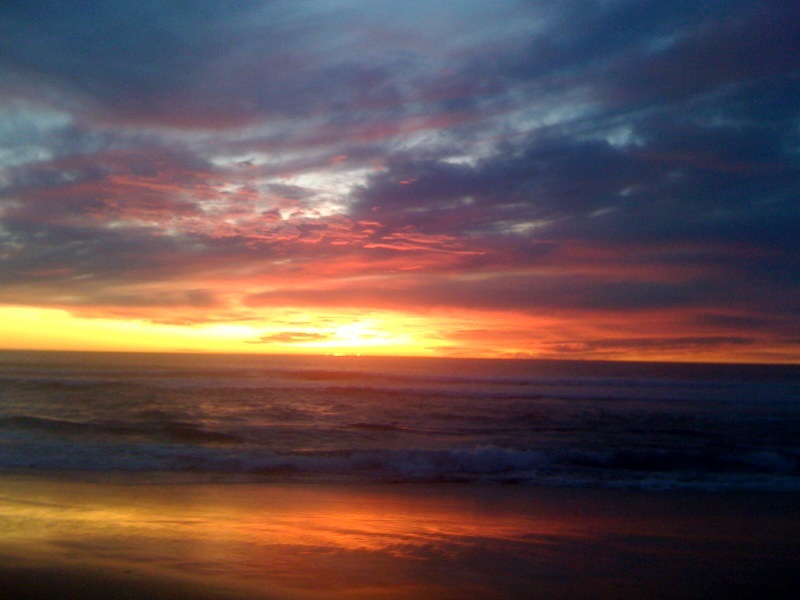 Close behind Kevin, in a very close race, is Northern Section's Steve Hotchkiss' photo of Broad Beach, shown again below. "County Recurrent" News would like to thank everyone who participated in this year's Squeegee Awards. Thank you for your nominations and thank you for your votes. And last but not least, thank you for your enthusiasm, support and contributions of stories and photos. We cannot tell your stories without your help! Rock The Vote !... For The Squeege Awards ! Thus far, the voter turnout for the Second Annual Squeegee Awards has basically sucked big time. Voting closes on Monday, March 15, 2010. Even if you have been nominated, you can still vote.... Hint, hint to Cal Porter, Kevin Curtis, Hotchkiss, Powers, Murphy. And Hubbie, we received your nomination but not your votes. Makuta, wake up. And you Ph.d/Recurrents ought to be voting too because, after all, it doesn't take a Ph.d to vote ! Woo Hoo ! Rock The Vote and Row The Boat ! Warren (Mr. Snyder) is an un-sung hero. WWII veteran, History teacher and mentor to dozens of Ocean Lifeguards. 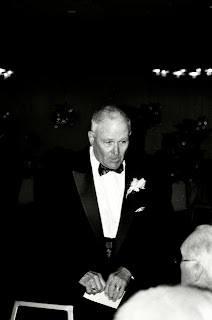 He dedicated his life to raising his family and to keeping all of us in line, SO WE WOULD NOT "END UP SITTING IN A BAR SOMEPLACE"
His wife Kay was the first person I remember to make me feel part of the gang at Reseda Park pool. As a 10 year old "pool rat", it was the first step in my aquatic competition career and is a cornerstone on what I have tried to keep going as my contribution. It all started for me because of the Snyder family and Warren's benchmark! He was a man to measure our Americana ethics by! I am proud and grateful to be associated with his family. I celebrate his life and pay tribute to his impact on me and the rest of us who had the privilege to have him as a mentor. His legacy runs deep to the thousands of students and aquatic beings that his work has touched. He will certainly be saluted by the warriors at the head table as he passes Valhalla on his journey to join his family and loved ones on the other side. 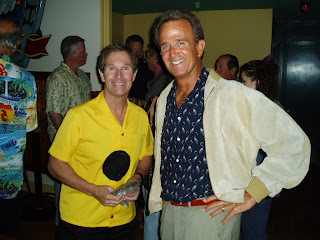 Father of three laco beach lifeguards and two nephews, Steve, Tom, Kenner, Barry, and Scotty Snyder....5 lifeguards ! norm shrifren, scott hubbell, tim mooney, john narz, jvd john van dynwick. The Memorial Service is Friday, March 12th at 1pm at St. Mel's in Woodland Hills. "County Recurrent" extends its condolences and sympathies to the Snyder family and to their friends and loved ones. Can any of us imagine life without the Snyder brothers? We take this time now to reflect upon, acknowledge and celebrate the love and nurturing that the Snyder brothers enjoyed with their parents, Warren and Kay. We all celebrate Warren's life and legacy. 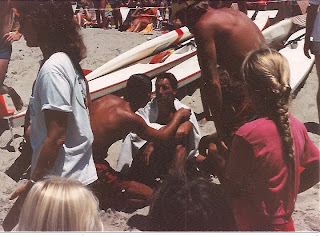 As a testament to Warren's life, we leave you with several photographs from our photo archive of some classic photos of the Snyder brothers, surrounded by their lifeguard friends and colleagues over the years. Our thoughts and prayers are with all the Snyder family, friends and loved ones. The Nominations Are In And It's Now Time To Vote ! The Nominations are in for the Second Annual Squeegee Awards. So it is now time to get yourselves off the fence or the jetty, as the case may be, and to put your pen and pencil to the vote ! "Memories Of The North Shore", by Bill Powers. Published on March 9, 2009. "Wieland Shield 2010...Win, Lose, or Draw? ", by Mike Murphy. Published, Jan. 25, 2010. The Top Three Blog Posts of this past year will win the Gold, Silver and Bronze Squeegee Award, respectively. The readership will recall that this time last year, "County Recurrent" presented its First Annual Squeegee Awards honoring and recognizing the Best Lifeguard related blog posts and/or stories of the year. Please submit your nominations to the undersigned. 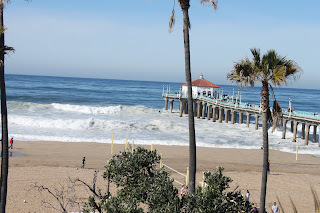 "Manhattan Beach Surf Breaks Loose !" "County Recurrent" is pleased to share with you three more great photos by surfer, paddler and former beach lifeguard, Adam Sandler, who was in the South Bay this past Sunday, Feb. 28, 2010 and was able to snap a few choice and tasty photos. 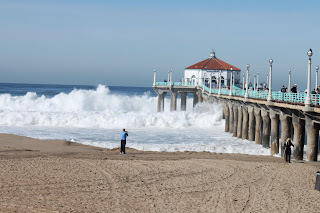 Per Adam: "I also took a few pics on Sunday of the surf at the MB Pier, but I didn't send them along because they didn't seem as dramatic as the breakwater getting swamped pic, and it would've also been a post about the image I missed. Shortly after I took the third pic, the surfer caught a monster right, but I was eating a Wahoos burrito at the time, so I missed the money shot! He got out of the water after the ride." Hey Adam ! Thanks for sharing these photos with the rest of us lifeguards. Please keep us informed of your photo shoots and adventures. Readers will recall our post of yesterday afternoon wherein we shared with you the March 3rd off duty rescue by LACo OLS Dylan Jones and two other surfers of an unconscious surfer found inside the impact zone at Black's Beach that morning. 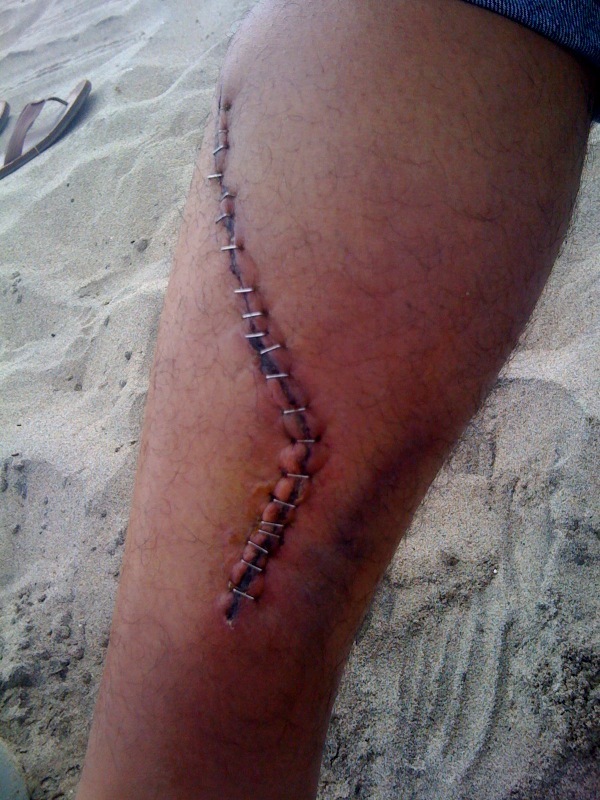 The following report was written up by the first State Beach Lifeguard to respond to this emergency. That Guard is noneother than LACo's very own (also) Recurrent, Ed Vodrazka. It is an exceptional and thrilling report to read and Ed has given us permission today to reprint it here. Buckle your seat belts, folks! This morning was beautiful. 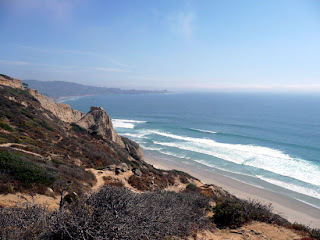 The surf was clean and well overhead, and from my house at Torrey, I knew that Black’s was pumping and that the surf crew in the line up would be limited to the big wave regulars. At approximately 7:40 (3-3-2010), I received an emergency call from the City Lifeguards stating that there was a CPR in progress at Black’s. 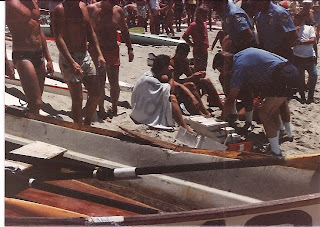 Budget cuts had necessitated pulling City Lifeguards from the beach which they share with State Lifeguards, thus no lifeguards were on scene. I responded Code-3 from Torrey not knowing what to expect. Chris Ryan, a veteran surfer and popular local at Blacks’ was seen taking off on a large wave…he pulled into a massive tube, was covered up and did not surface. He was held down for at least a second wave, and possibly more. A local surfer named Philippe Duhaime was paddling out inside of Ryan and witnessed the event happen. Eventually Ryan floated up, still attached to his board. He was face down and lifeless. Duhaime struggled to hold Ryan up while he yelled for help to the pack outside. As fate would have it, LA County Lifeguard / Medic (and Black’s local) Dylan Jones was in the pack and heard the call. Jones took off on the next wave from the outside, expertly surfed it where Duhaime was holding Ryan and grabbed hold of the patient. Jones’ skills as a waterman allowed him to load the 180 pound unconscious patient on his 7’0 single fin and paddle him to shore. Jones’ skill in the water was likely the single greatest element to saving Ryan’s life, as only 3-4 minutes passed before the patient was on shore and being worked up. Ryan’s fate was further blessed when an off-duty physician and fellow surfer (Dr. Mark Barcker) arrived to assist. Barcker and Jones began working on Ryan immediately. Ryan was completely lifeless; skin purple, apneic, pulseless, with blown pupils. The men had no AED, no resuscitator, no BVM nor pocket mask. A small crowd of locals watched in disbelief as their friend lay lifeless on the sand….apparently dead. Although Ryan’s fate may have been to die this morning, he had no idea that he would have a “dream team” on scene to reverse that fate. Jones and Barcker worked together flawlessly. Jones, a recent graduate Paramedic took over airway management while the doctor assumed compressions. The doctor admitted that he needed an impromptu refresher on CPR compressions, which Jones gave him, then the team worked efficiently to save Ryan’s life. Shortly after CPR was begun, Ryan’s pupils began to respond. Soon after, he regained a pulse and then regained spontaneous respirations. Medics arrived several minutes later, but by that time, the patient was already conscious and was answering questions. Ryan had aspirated a considerable amount of salt water, and his fate (although encouraging) is still unknown. I’m writing this narrative only 2 hours after Ryan went down. There is little doubt in my mind that the efforts of Jones and Barcker saved Ryan’s life this morning and that had they not been there, it is doubtful that anyone else on scene would have been able to successfully orchestrate the rescue effort. Imagine my surprise, when I pulled onto the scene and I see the patient, reported as pulseless and apneic, now sitting up and talking. I was even more surprised to see the jubilant face of our good friend, fellow LA County Lifeguard Dylan Jones on scene. The SD City Lifeguards, the State Lifeguards, and the SD City Paramedics were thoroughly impressed with the efforts of these men today. My pride as an EMT Instructor and an LA County Lifeguard could not be more full. I’m certain that the City Lifeguards will further (and more formally) acknowledge the efforts of Dylan Jones…I just wanted to get the first word out to you guys. In short, I wanted you to hear it from me first. Ed: Thank you very much for allowing us to reprint this amazing report that you wrote of this recent surf rescue at Black's Beach! We really appreciate it. LACo O.L.S./Paramedic, Dylan Jones, "To The Rescue"... off duty. LACo O.L.S. and former "Recurrent" Lifeguard, Dylan Jones, also a recent graduate of paramedic school, participated in an off duty inside the impact zone surf rescue earlier this week in San Diego at the infamous Black's Beach. Way to go, Dylan ! Together with two other beach patrons, Dylan participated in reviving the victim and transporting him to arriving EMS for transport to the hospital. 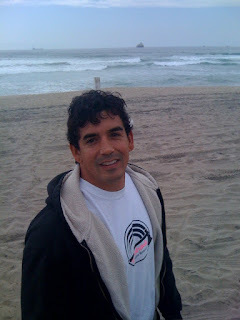 Thursday, March 4, 2010 at 12:55 a.m.
"County Recurrent" first learned of this exciting and fortuitous surf rescue story from Chris Brewster's daily LifesavingNews email service. Many thanks again to Chris for his diligence in this effort. "Yes, we heard about this yesterday from the State Lifeguards and the San Diego Lifeguards. Dylan is one of our permanents who recently graduated from Paramedic school. He was a professional surfer before becoming an OLS for our Division. That surfer was very lucky that Dylan and a doctor were surfing that day – I guess it was meant to be, Phil. He will be up for a Medal of Valor for this act." Three Cheers to Dylan, the doctor and the medical student for their quick action which saved this man's life ! Heads up ! For those of you unfamiliar with Chris Brewster's daily email postings of Lifesaving Events Around The World, we take this opportunity to let you know about it. As stated by Chris, LifesavingNews is "An occasional posting of news pertinent to lifesaving." B. Chris Brewster, kneeling with his rescue tools, San Diego, Calif. Photo Courtesy of Chris Brewster and used here with permission. There is no cost to subscribe to Lifesaving News. bogus birthdate if you like, to maintain security. Many Thanks to Chris for his dedication to communicating and sharing Lifesaving News with all of us. Have a look, you will not be disappointed. "Waves breaking over the breakwater today at King Harbor in Redondo Beach (directly across from the Harbor Patrol HQ)." 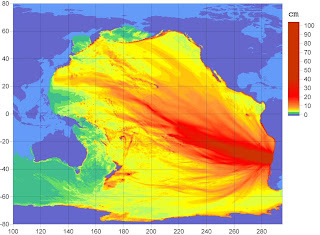 Chilean Tsunami Causes So. Cal. Tidal Activity! (Photo above: "Chileans inspect the damage caused by the 8.8-magnitude earthquake and subsequent tsunami along the coast near Concepcion on February 28, 2010. 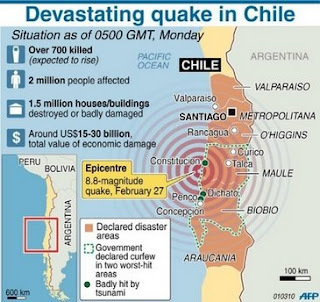 Chile's quake toll topped 700 as rescuers searched for survivors and the extent of the disaster became clear in coastal areas where giant waves swept away homes, even as the government apologized for failing to issue a tsunami alert. 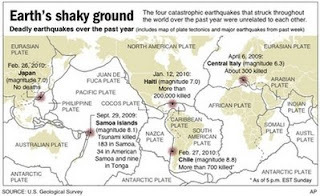 (Source: AFP)"
(Map above locates the deadly earthquakes over the past year; includes map of plate tectonics and major earthquakes from past week. (Source: AP). The devastating 8.8 Earthquake in Chile in South America early Saturday, Feb. 27, 2010 created both localized Tsunami conditions along the Chilean coast, as well as Tidal flooding as far away as northern Japan and discernible tidal activity in San Diego County, Orange County and L.A. County. 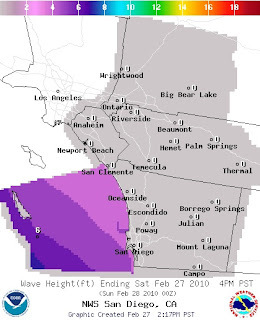 "Although the threat of tsunami waves hitting South Bay beaches never materialized Saturday, local authorities worked to make sure that beach-side residents were safe from harm. 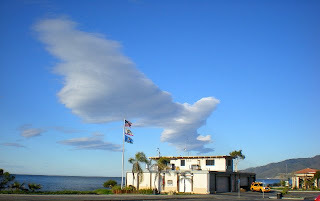 Port of Los Angeles Police kept watch over Cabrillo Beach in San Pedro. And while they didn't ban people from going to the shore, they did warn them about the possible risk they could encounter. "It's the prudent thing to do," said Sgt. Mike Alva of the port police. At the nearby lifeguard tower, Capt. Tim McNulty kept a keen eye on the waves crashing below. "We're looking for any signs," he said. "We advised people to stay away from the beach and out of the water." "Unusual Tidal Activity Reported On Two La Jolla Beaches"
"The spectre of large tsunami waves hitting Southern California seemed to be a washout, but lifeguards in San Diego said they spotted unusual tidal activities at two La Jolla beaches. "It wasn't dangerous, but the water went out lower than an especially low tide and came back in," said San Diego lifeguard Lt. John Everhart. "That was definitely a tsunami event." 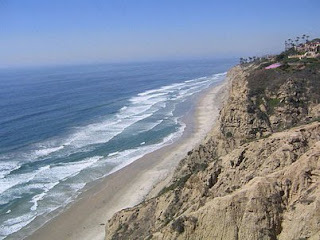 Everhart said the tidal surge was seen around the La Jolla reef and Birdrock area. The guard who witnessed it said the tide flowed out to a minus 2-foot depth and returned to a 4-foot tide level. "Normally what would take five hours took 10 to 15 minutes," Everhart said."